Happy Monday! I hope you all had a great weekend. Ours was very relaxing. This is a look I wore out on Saturday during the day to lunch on the water. It was such a beautiful day. I really can not stop wearing this new J.Crew hat. I am obsessed with it. I was looking for a larger hat but I don't like big floppy hats. They drive me crazy because I can't see. So this one is perfect. And I am really in love with this skirt. It is perfect for summer. Classy and beautiful! 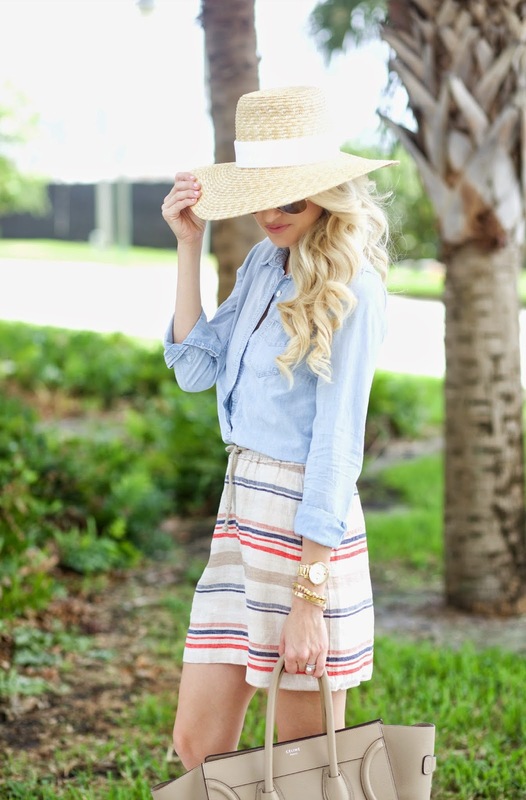 Love the skirt and the hat! Great outfit, love it! So much nautical feelings, love it! 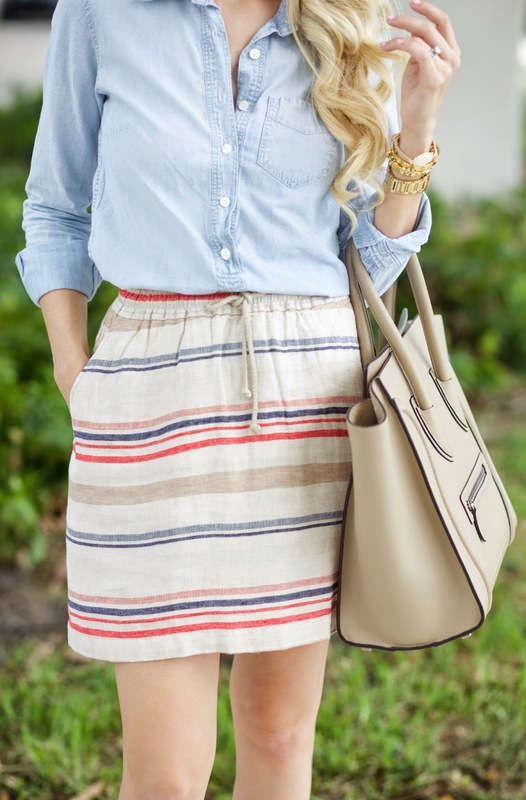 That skirt is really gorgeous and fit you perfectly! Love this casual outfit!! Such a cute skirt and I love the hat!! 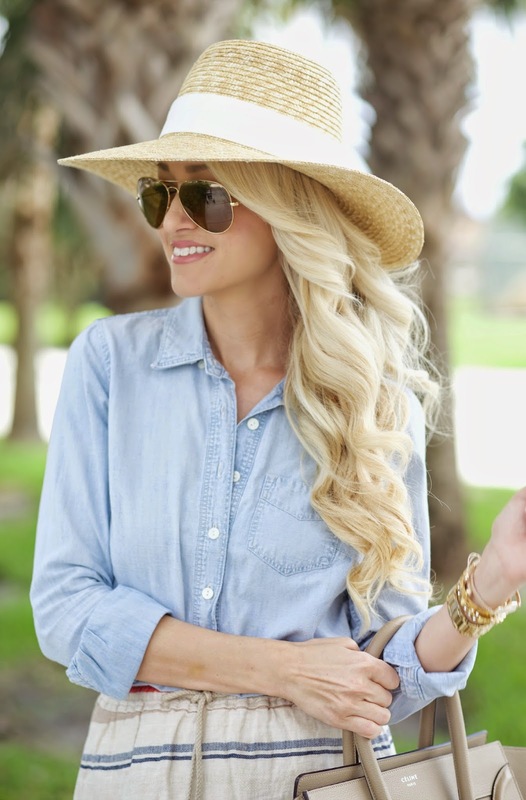 perfect summer style! love the calm colors! Love this look, Jade! That hat is so pretty and your hair looks gorgeous as always! I'm in love with this outfit! That skirt is gorgeous! Absolutely love this hat! You look gorgeous and your hair is just stunning! your curls + the hat = so cute! great weekend outfit! I love that skirt (it looks great in the dress too)! So cute. Have a great week! This is such a cute casual chic outfit for summer, so pretty! The hat is so lovely as well! Oh I just LOVE how summery this outfit is! It looks so light and comfortable. gorgeous!